1 dribbles to the left wing. 5 sets a cross screen for 2. 2 pops out to the left wing. 3 cuts to the left corner. 1 passes to 2. 4 sets a backscreen for 1. 1 cuts to the middle of the lane and pops out to the right wing. 2 passes to 4. 4 passes to 1 and sets a ballscreen on 1. 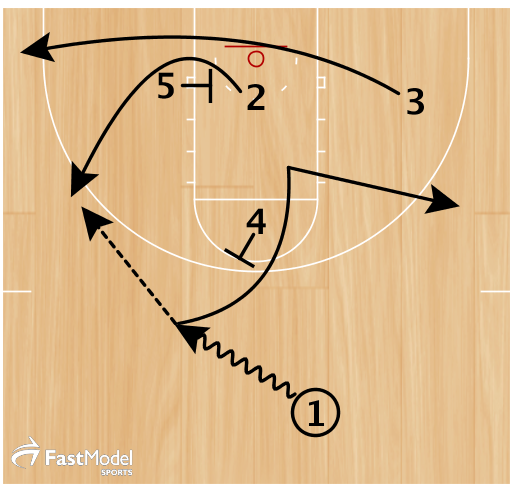 4 sets a ballscreen on 1 and rolls to the short corner. 1 attacks the middle of the lane.